Canon's PowerShot SX710 fixed lens camera provides quite a collection of impressive features for a relatively thin point and shoot model, offering more than 20 megapixels of resolution, a high-speed image processor, and wireless connectivity, all in a model that's less than 1.5 inches in thickness. The image quality could certainly be better with this model, as it only carries a 1/2.3-inch image sensor. Cameras with such small-sized physical image sensors tend to struggle in tough photography situations and simply cannot match what's possible with more advanced cameras, such as DSLRs. The Canon SX710 fits in that category. The PowerShot SX710 records good quality photos when shooting in sunlight, but the images aren't going to match what more advanced cameras can accomplish. Low-light photography is especially problematic with this model, as you'll see noise in images once you reach mid-ISO ranges, and the camera's performance slows considerably when you're shooting with the flash. You may find yourself wanting to use the Canon PowerShot SX710 outdoors -- where it is a strong camera -- quite often thanks to the 30X optical zoom lens Canon included with this model. The great zoom lens and small camera body size of this model make it a nice option for taking with you on a hike or when traveling. Considering the Canon PowerShot SX710 has only a 1/2.3-inch CMOS image sensor, its image quality is pretty good. You'll normally find such a small image sensor in physical size in a basic point and shoot camera, whereas more advanced models will make use of larger image sensors, which typically yields better image quality. Still, Canon's SX710 gets the most out of its small image sensor, creating sharp and vibrant photos when shooting outdoors. With 20.3 megapixels of image resolution available, you'll also have the ability to do some cropping on your full resolution photos to improve composition, while retaining a large amount of resolution. Indoor photos and low light photos are where the PowerShot SX710 starts to struggle. While flash photos are of decent quality, the camera's performance slows considerably when using the flash. And when you choose to increase the ISO setting to deal with low light situations, you're going to begin to encounter noise (or stray pixels) at the mid-ISO settings. Viewing these photos on a computer screen will yield very nice results, but if you want to make really large prints, you're probably going to notice some loss of image quality with this Canon model. Similar to what occurs with image quality, the Canon SX710's performance and speed are pretty good in outdoor lighting, but they suffer considerably when shooting in low light. Shot-to-shot delays and shutter lag perform well above average versus similarly priced cameras when you have plenty of light to work with. But if you have to use the flash, both shutter lag and delays between shots will hinder your ability to use this model effectively. Autofocus is accurate with the SX710, but Canon also gave this model a manual focus capability. Although Canon gave the PowerShot SX710 Wi-Fi and NFC connectivity, both features will drain the battery quickly and are a little tough to use. If you're using the SX710 as a travel camera, though, having the ability to upload backup copies of your images while traveling is a nice feature. Performance in movie mode is good too, offering full HD video at speeds up to 60 frames per second. The design of the PowerShot SX710 is really nice, offering a large optical zoom lens in a relatively thin camera body. 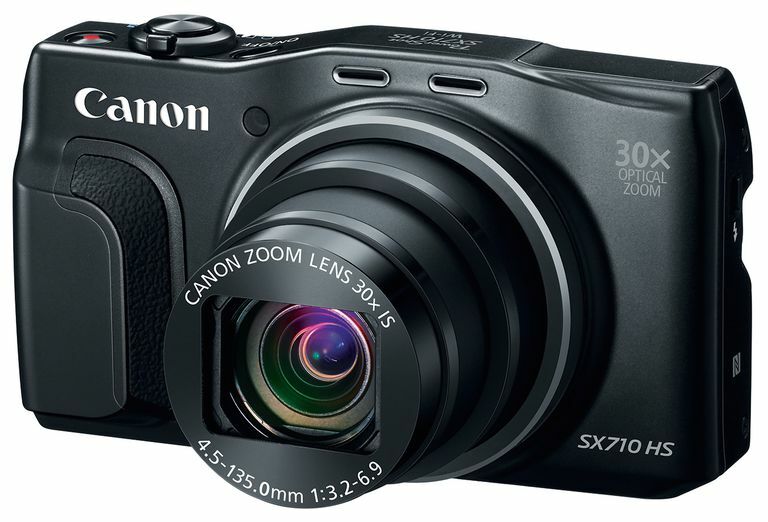 But the design is also part of the problem, as this model is almost identical in look and performance level of the model Canon released a year earlier, the PowerShot SX700. Considering the introductory price of the SX710 is quite a bit higher than the year-old price of the SX700, you may want to think twice about purchasing the more expensive model. A 30X optical zoom lens represents the highlight of the Canon SX710's design, which is especially impressive when you consider this model measures only 1.37 inches in thickness. It's really handy to have a camera you can slide into a pocket (even if it's a snug fit) and yet have access to a 30X optical zoom. Although the SX710 does not have a touchscreen, its LCD is a nice option, measuring 3.0 inches diagonally and offering 922,000 pixels of resolution. There's no viewfinder either with this model. Despite being a relatively thin camera, this model did fit our hand pretty well, making it comfortable to use.